About: Ravels Bistro serves good quality, home made dishes, based on French and European cuisine.All desserts are made on the premises and meals are served with a basket of hot gourmet breads.Ravel's has an amazing list of famous patrons including Chris Evans, Chris Martin, Katie Melua and Michael Palin. I had a charming evening at this wonderful restaurant with friends. The service was excellent, the waiter chose a perfect wine for us all and the food was exceptionally good! I chose tuna and it was cooked perfectly! The sticky toffee desert was excellent, not overly sweet, just perfect! I have walked passed this restaurant on many occasions and I am so glad I chose to go there on this night. I cannot fault it! 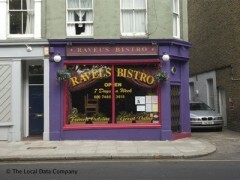 Ravel's Bistro, London NW3 is one of those 'special finds' that are rare in London. It is a local French restaurant inspired by its delightful Polish owner Dorothy, who makes one feel at home from the very beginning of your dining experience. There are daily vegetarian, fresh fish and meat options......a choice of 3 starters + 4 mains each day and the 'set menu' which has an excellent variety of starters, mains and desserts - great value for money! The wine list is comprehensive and very reasonably priced. This bistro is a real gem.....and never fails to disappoint in any way! Although not typically French (run by Polish people), I really enjoyed the experience: very pleasant and professionnal service, the food was very varied (again not typically French), fresh and well cooked. I however did manage to get my Kir (typical French aperitif) that most English restaurants and pubs have no clue how to serve. Happy to recommend for anyone looking for an informal and pleasant dinner. Prices were reasonable. the atmosphere of this place is enchanting, the staff charming and helpful, and the food excellent. A great variety of vegetables acompanies all dishes, the fish is superb, and the main dishes generous. The decor is redolent of the French bistro style at its best.